Early February. It’s been approximately three months since the last leaves fell off the trees. I am really ready to see green again. 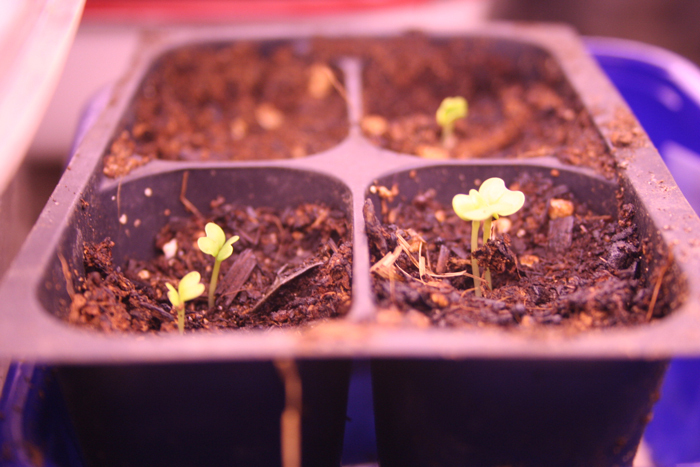 Fortunately, this is the month that I begin my first seedlings which will begin growing under lights in my basement. 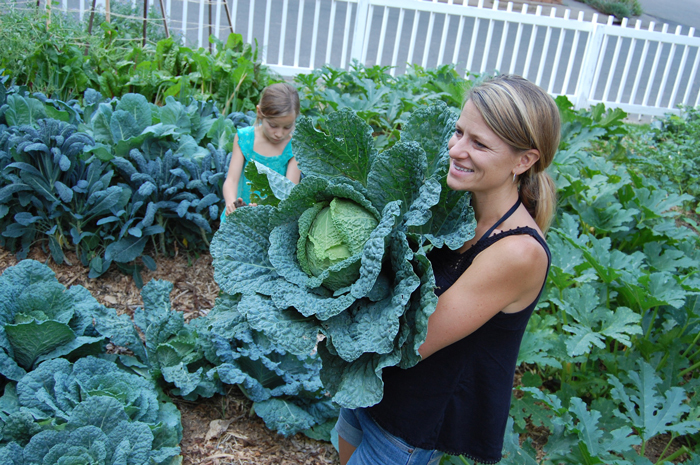 I start with the cold season crops: cabbage, kale, onions, asian greens, broccoli, collards. These will be ready to go to the greenhouse, then into the ground the earliest. 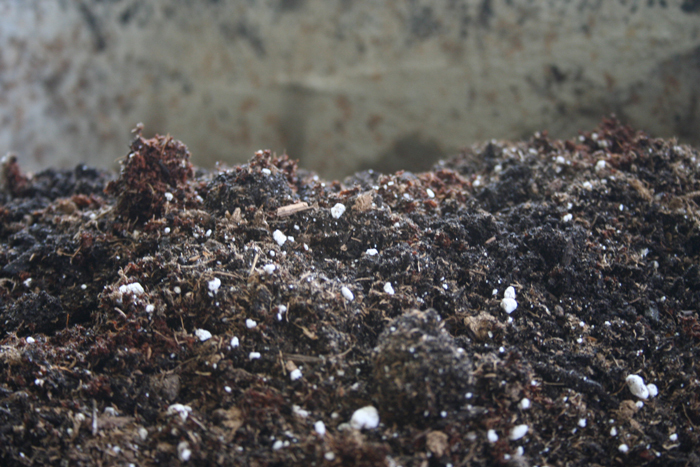 The coconut coir is sold in blocks which are condensed and expand with water. I chunk off parts of the block and add water to it in a wheelbarrow. Since it’s usually snowy and cold outside – I do this in my kitchen. Yep… just wheel it right inside. Once the soil is mixed, I sterilize my seed pots. Since I save and re-use them each year, I’ve learned that fungus or disease can potentially ‘overwinter’ in my pots, so I give them a fresh start each year. Last year I used water with a small amount of bleach. This year, I used SilverSol. It kills far more than bleach could, and it’s non-toxic. Just a splash, a little goes a long way. 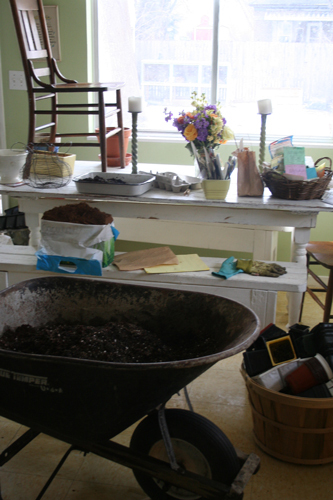 Once the pots and soil is ready – I begin filling pots and setting out my seeds. Keeping good records is another important tip to having a successful garden. Write down what you plant, when you plant it. My garden journal from last year reminds me when to start things, when to change and how to improve. We have installed flourescent light fixtures in our basement, which we’ve fitted with aquarium bulbs. When setting newly planted seeds under the lights, keep them as close to the bulb as possible. 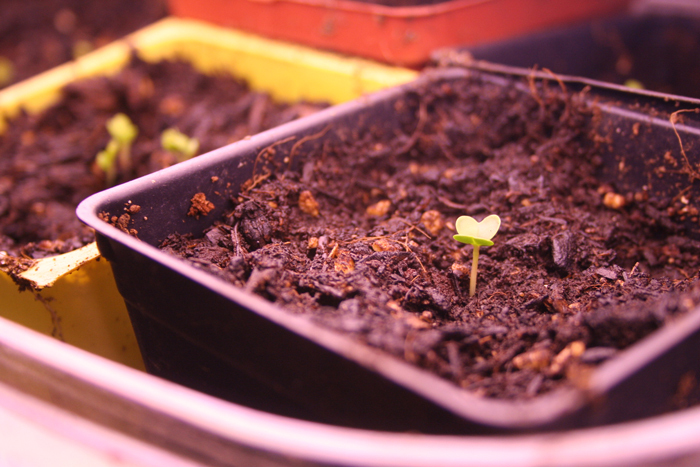 The seedlings will try to reach the light, so as they grow, you can adjust the distance. Plants which are given too much space will grow ‘leggy’ and won’t be as strong. Empty lettuce boxes (this one was from a live butter lettuce head) from the grocery store can be saved and used to put seed pots in. 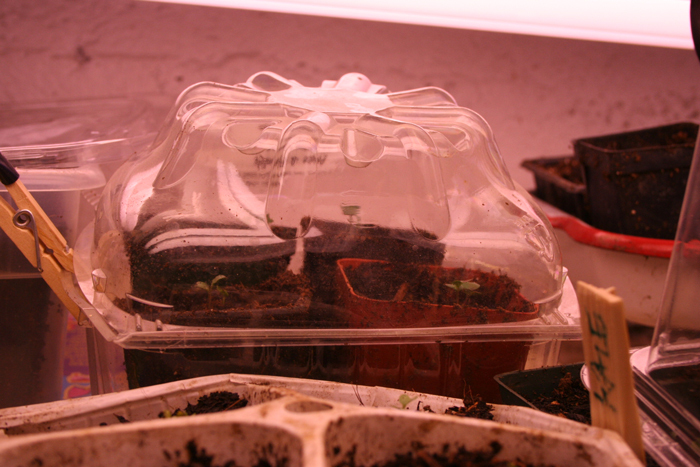 The lids help the seeds to germinate quicker. My kids help me to label my seeds. 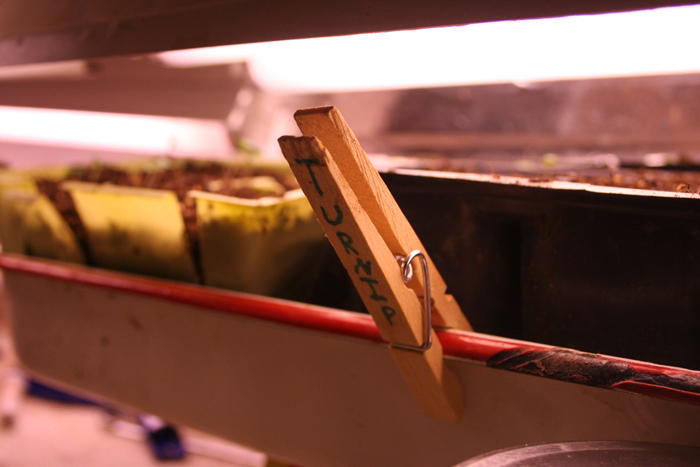 Use whatever you have, but use a sharpie so that the marking doesn’t come off when watering your seeds. 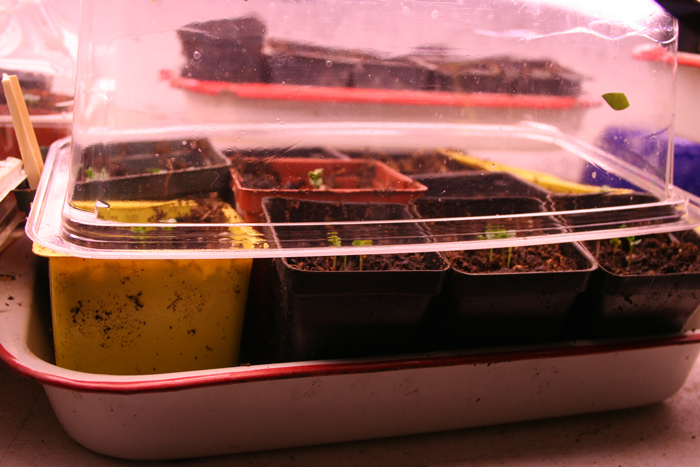 A large spring mix container being used to help these seeds germinate. This will be removed and the plants moved closer to the light – either by lifting the pots higher, or lowering the light fixture. It always gives me a thrill to see my very first cabbage and kale plants pop through the soil. What a miracle to watch them all the way from seed to garden to table. It’s these photos that get me through the long winter months! 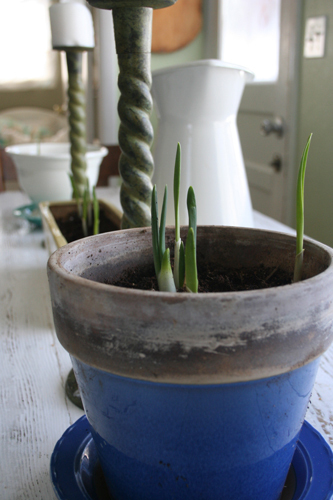 I also keep a few green plant ‘babies’ on my upstairs kitchen table. These bring me some early Spring cheer, as well as remind me to go downstairs and remember to check on the others in the basement! These were garlic cloves which had started getting green tips. They can be transferred to the garden later, or the tops can be picked and cooked with (like scallions).